Stofix is a Finnish headquartered company providing the most innovative brick slip solutions. Since its establishment in 1993, company has been at the forefront of development in the tradition of brickwork. Our aim has been to find a way to construct brick cladding that genuinely meets the requirements of modern construction industry and building technology. Stofix Group is an international company. We supply the Stofix Ventilated Brick Facade world-wide, to all continents. We started our own production in 1997, and since then, we have been manufacturing our energy efficient, technically superior brick cladding panels. The automated production line manufactures the Stofix brick cladding panels in optimal, carefully controlled conditions. To guarantee the durability of the cladding, we only use burnt bricks from well-known manufacturers. The durability of Stofix brick cladding is ensured with rigid quality control of the entire value chain, from raw materials to manufacturing and installation. Stofix has taken giant steps forward since we began our product development two decades ago. Our development efforts have convinced researchers, architects and engineers alike, and a growing number of these professionals agree that Stofix is the smartest way to construct brick facade. The Stofix method of constructing genuine brick facade quickly and more energy efficiently has attracted considerable interest worldwide. 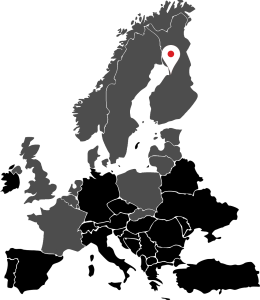 Stofix branches are located in Finland, Sweden, Norway, Poland, UK, France and Benelux. Projects are constantly delivered in other countries as well, more information of these can be found from References. Our factories are located in Poland. We want to take care of our shared environment in many ways. Stofix products are made of recyclable materials: metals, kiln-fired brick and natural stone, and all the production waste is recycled. The Stofix brick slip cladding system have up to 50% smaller carbon footprint compared to traditional brick laying.